So, once you’ve dealt with whatever hassle you should go through to complete the required health exam in your own country, you get to do it all again when you get to Korea. The way NIIED words it in the official information, it sounds a little like you will do the exam at orientation, but that’s not perfectly true. It probably won’t be at the NIIED orientation in any case. Each language institute or graduate school will arrange for you to do the exam either at school, or somewhere nearby. KNU invited the official health exam people onto campus to check everyone in our classroom building. And then it was done. Pretty simple, and non-invasive. One other thing about the medical check in your own country – you should keep an electronic or a physical copy of it for your own records. I highly recommend sending a scanned copy to them by email before you send the original copy, and in that case you would have an electronic copy, but if you can’t do that, try to make a photocopy. If you are planning to live in a dormitory at your school (and if you are doing the language year you have to live in the dormitory), they will require you to submit a health examination before you enter. If you tell them that you have already submitted a health exam to NIIED, then it is likely they will waive the requirement to get another health exam, but just in case, it is good to have a copy of your health exam results to show to them. It’s raining so much here in Chuncheon! On such a lovely day, what better thing to do than to sit inside and take a Korean placement test, right? If it is your first time coming to Korea, or starting at a new language school, you may be curious about what this experience will be like. I’ve now done it twice. 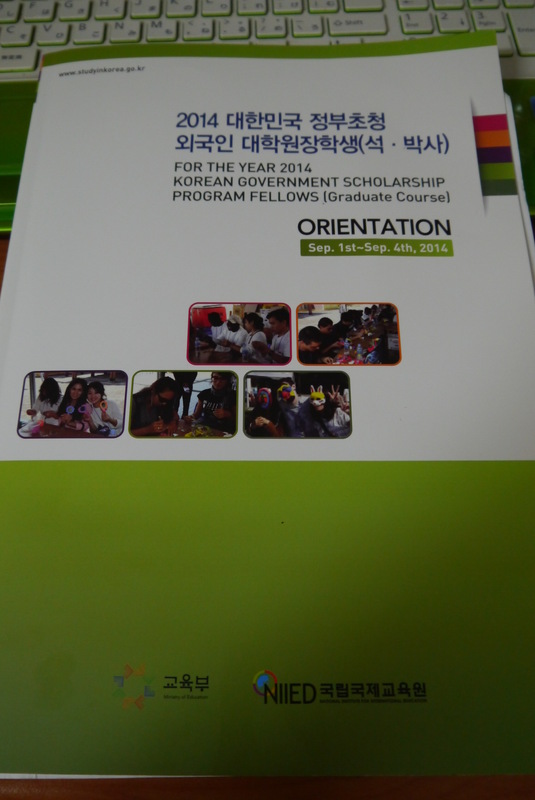 The first time was at Yonsei’s 3-week summer program 2-years ago. 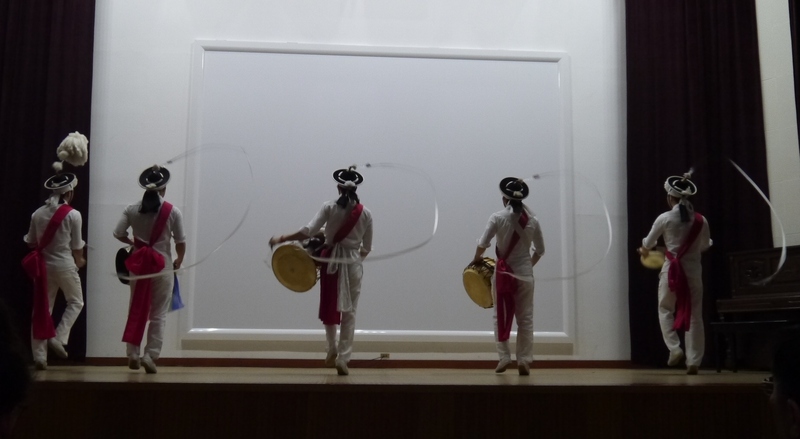 The second time was obviously this afternoon at Kangwon National University. The two experiences were pretty similar, so I would guess you will experience something similar no matter where you go. Next, the written tests are usually written from very basic stuff at the beginning to very difficult stuff at the end. Obviously a placement test should be able to show the teachers if a student is level 1, 2, 3, 4, 5, etc, so it should have a lot of different stuff on it. The nice thing though is that they put the stuff in order. 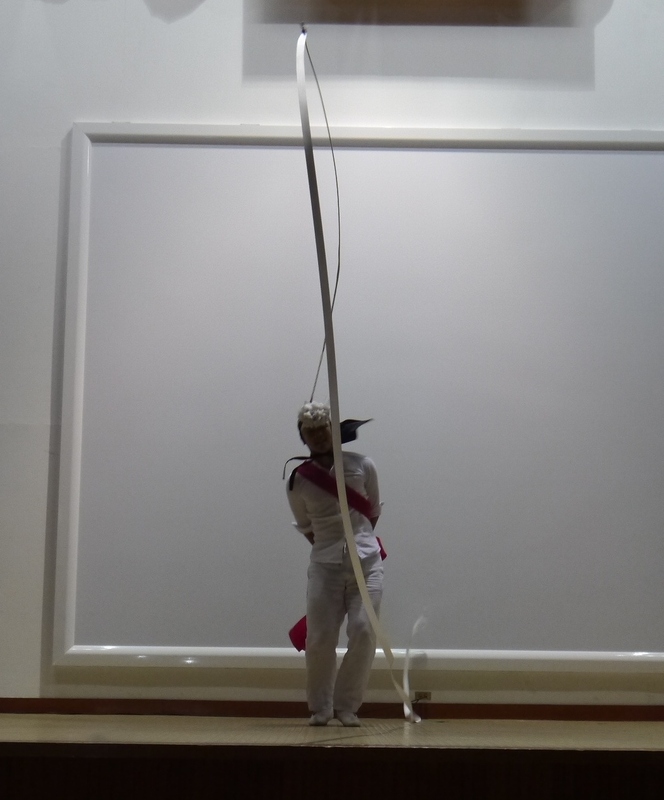 (Both Yonsei and KNU did this, and I think it is pretty standard.) What this means is that you can start at the beginning, do as many questions as you can, and then just stop when you stop understanding. (You might want to look at the next few pages/questions to make sure.) I feel like the Yonsei test was much longer than the KNU one, but that might just be because I was less proficient, so there was more I left unfinished. In any case, the length of the test will probably vary depending on the school, but you will probably be able to stop and/or leave when you finish what you can. Both Yonsei and KNU also had an interview part to the test. At Yonsei we took turns going outside in the middle of doing the written test. At KNU we went for the interview after finishing as much as we could of the written test. Listen to the teachers’ instructions to find out how that works. The questions will vary depending on the interviewer. They may ask you to introduce yourself (again) and work off that. If you speak well the questions will be harder. If you are more of a beginner they may ask more simple things. At Yonsei, I remember the interviewer asking me to name things in the room around me, or what my plans were for the weekend. Here at KNU it was more like a regular conversation. In the end just remember that this is just a placement test. There is no pass or fail. There is no shame in not understanding some (or many) questions. Don’t be nervous and do your best. Also, if you feel like you really weren’t yourself and didn’t place as highly as you should, or the opposite, if you placed more highly than you think you should, there will usually be a period of time in the beginning where they will allow you to change. Speak up within the first day or two of class, and remember that the teachers will ultimately have the final say about it. As someone who has jumped around from school to school both in Japanese and in Korean, I can say that repeating some information is not a bad thing if it means not skipping other important information. A strong foundation is really important for language learning. It is possible that you will find yourself repeating some information at the beginning of your class, but it is likely that you will find newer, harder things as it progresses. Before asking to switch to a higher class, take a look through your textbook and see what you might be missing. 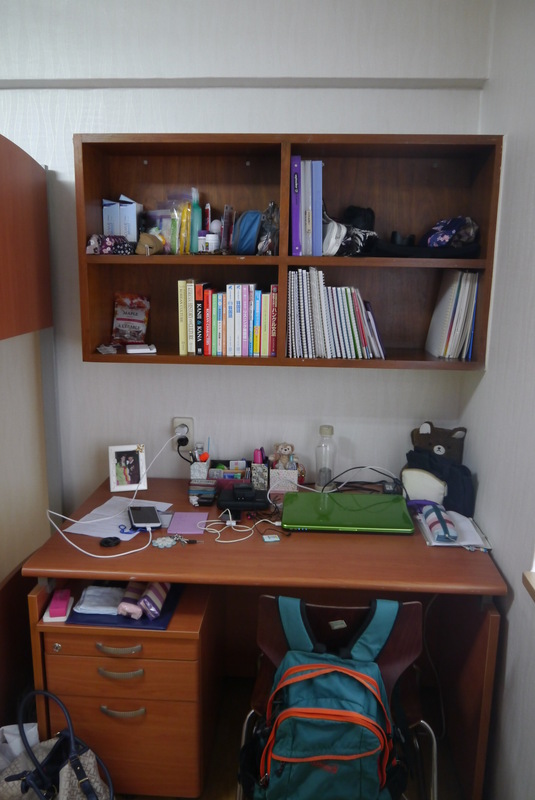 FAQ ~ Where will I study Korean? If you are selected for KGSP, and do not yet have TOPIK 5 or 6, you may be curious about where you will study Korean for your language year. The answer is not so easy. The first thing that I can say is that you will not study Korean in the same region as your degree school. This is definite. They do this on purpose so that you can experience different parts of Korea. Personally, I think this is a good thing. Different parts of Korea have different dialects and cuisine etc, so getting to know them is enriching for you as a Korean traveler. Another advantage, especially for those ending up in Seoul, is that whatever region you end up in is likely to be cheaper to live in than Seoul. A year to save up is not a bad thing. The next thing I can say is that you cannot choose where you will study Korean, nor can you change schools once they have decided for you. You can’t do it, it doesn’t happen, end of story. So then what are the possible places you could be sent? The answer to this question varies by year. This year (2014 selectees) there are ten schools, but last year (2013 selectees) there were twelve schools. In addition to a reduction of the number of schools, there were also some changes to the schools. Seoul/Red – These three universities were used for 2013 selectees, but for 2014 there are no schools in Seoul proper. On the map below you can see approximately where everything is. The highlighted areas are special designated metropolitan areas. 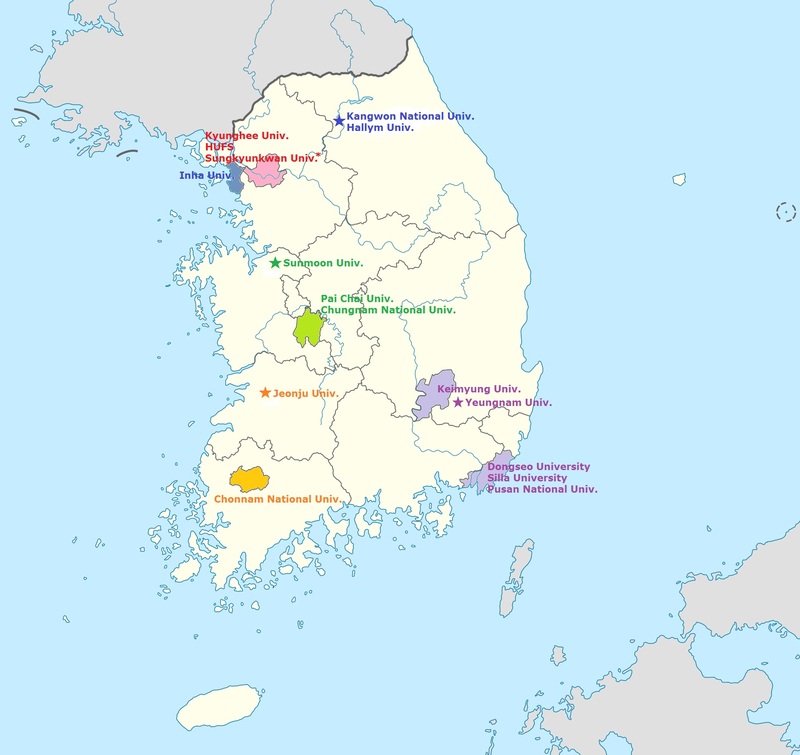 These are Korea’s bigger cities (Seoul is pink, Incheon is blue, Daejeon is green, Gwangju is yellow/orange, Daegu is the inland purple, and Busan is the coastal purple). The stars are smaller cities. You’ll notice that even when they’ve changed schools, they’ve generally added a school in the same general area, for every school they’ve taken away (with the exception of Seoul). As for how they choose which schools to send people to, that is a mystery. One thing you will notice is that none of the old, well established schools are on the list; such as Yonsei, Korea U, SNU, Sogang, Ehwa, etc. Part of the goal of KGSP is not only to raise the level of Korean among foreigners, but to also raise the level of Korean language education in Korea. Well established language programs have little trouble filling spots, and can constantly work on improving their programs with student feedback and results. 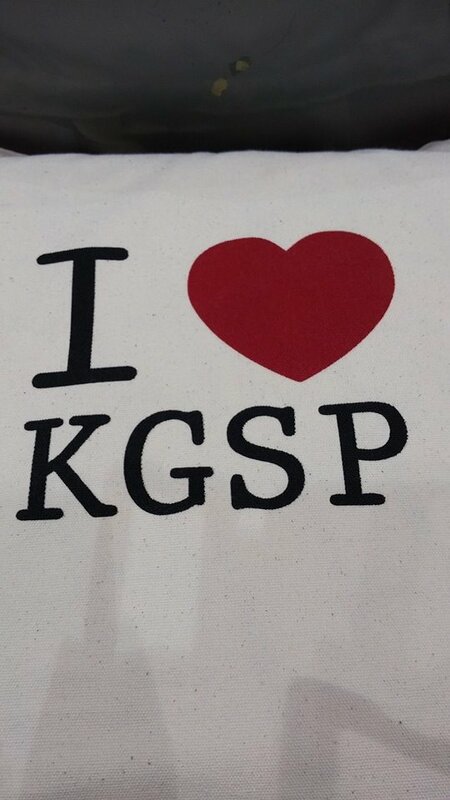 Smaller programs like the ones KGSP uses need more help. Beyond that, I’m not sure what motivates NIIED to drop one school, keep another, and add yet another. The group of schools for 2015 and beyond may be similar, or totally different, but they will probably be in the vicinity of existing schools. Author fromrisingsuntomorningcalmPosted on September 2, 2014 September 2, 2014 Categories FAQ, KGSP, Korea, Korean LanguageLeave a comment on FAQ ~ Where will I study Korean? Well, it applies to situations between KGSP year groups as well as those within year groups. If you’ve followed my advice and watched Lolaloveskorea on YouTube, or found her on your own, or found other blogs from 2013 KGSPers or earlier that talk about NIIED orientation… yours may not be like that. And I’m not necessarily complaining. Last year it appears they bussed everyone to the same place and did a two day orientation/tourism thing – in matching yellow polo shirts. This year, they are being more economical and practical. We were divided into 4 groups of 2-3 language schools plus people in the area who are exempt from language study. And we got a tote bag and towels instead of polo shirts. 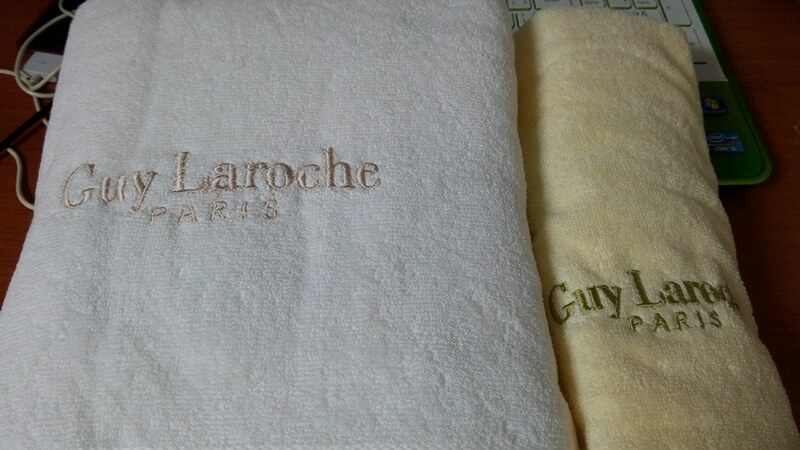 Inscribed towels. If you spend long enough in Korea, you’ll probably end up with a lot of these. My group went right to the NIIED headquarters in Seoul, but other groups are gathering at one of the language schools nearby. And then we went home. All told from checking in to going home, we were there for about 5 hours. If you achieve TOPIK 5 (or 6) then you MUST start your degree program at the earliest opportunity (September if you do it before you arrive in Korea, or March if you get it between September and February of your language year). You cannot choose to do more language study. You CANNOT change your degree university under any circumstances (and keep the scholarship). It has never happened in the history of KGSP. During the application process they got between 400 and 800 emails a day! With a relatively small staff, that’s a lot of emails, so refer to this post and think carefully before you send them email. Again, I’m not saying don’t send them email, just think about it carefully. And that’s what our orientation was like. Yours may be similar or completely different. 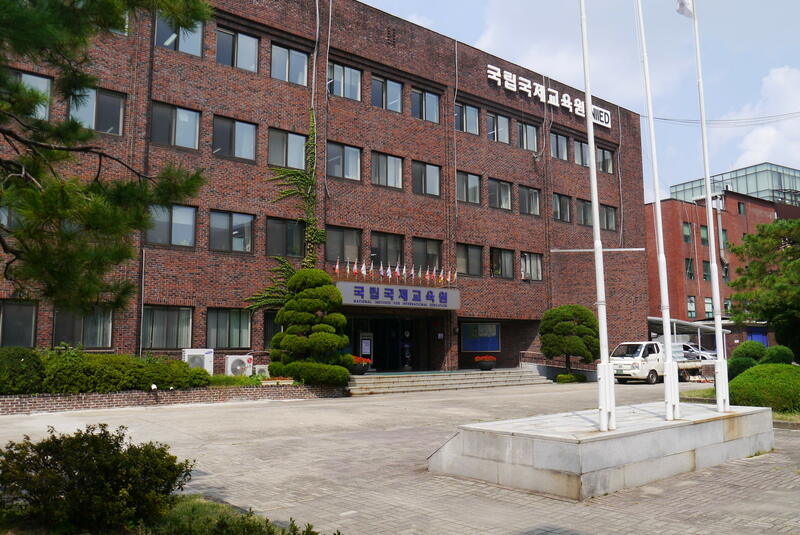 Today I arrived at my language institute – Kangwon National University. Most people got picked up at the airport, and then, after perhaps waiting for some other people to arrive, they were bussed to the University. But being in Korea already, I made my own way here and just checked in with the coordinator. After that I was pretty much on my own. The plus is that they give plenty of time for people to get settled and rested. Some people are coming from very long distances after all. The minus is that until orientation here, which isn’t until next week, there isn’t a lot of guidance about how things work. Of course the dorm managers and program coordinators are always willing to help and answer questions. And now about our dormitory here at KNU. Remember ESID. Wherever you are the dormitories will be split for men and women. 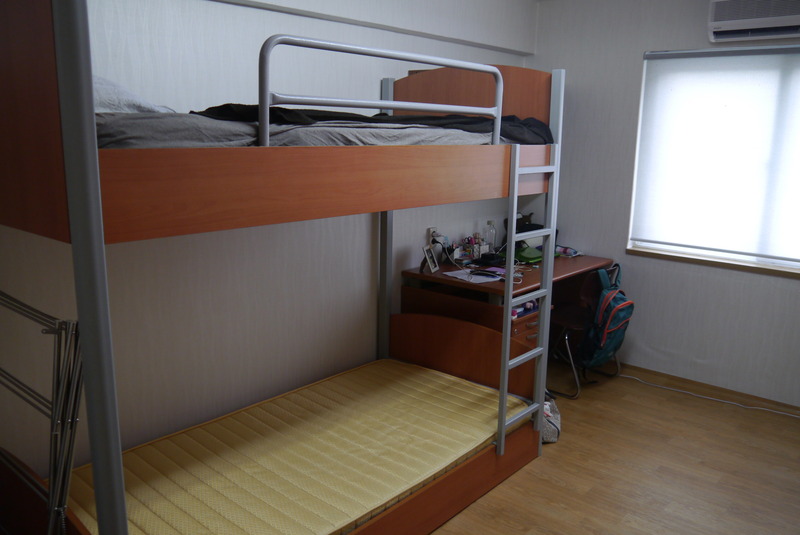 In the USA it is not uncommon to have co-ed dormitories, but Korea is a little more conservative. Our dormitory is, frankly speaking, pretty old. But, the rooms seem to have been recently renovated and they are clean. My room is small, but functional. 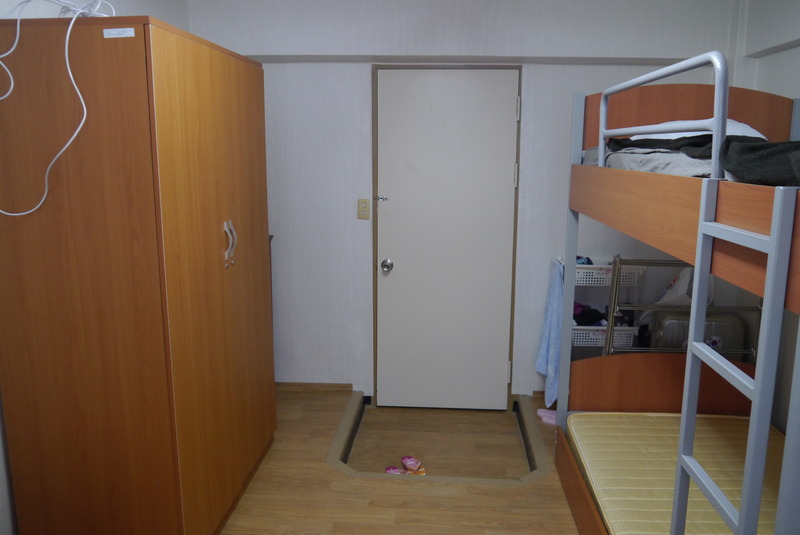 It has bunkbeds (not ideal, but I can live with it), two desks, a smallish closet, and a shoe cupboard (you always remove your shoes before entering the room, so you need someplace to put them). There’s one drawer at the bottom of the closet, but otherwise not a lot of room for clothes you don’t hang unless you purchase something extra (and there are cheap options, as well as some space in the room to put it). There’s not a lot of room for clothes you do hang, so it is further incentive to pack light! I will definitely be switching over the closet from warm weather to cold weather clothes as the season changes. Mine will probably go back home to Seoul (I haven’t even brought winter stuff), but if you don’t have that luxury, you can store stuff in an unused suitcase. As you’ve probably noticed from the description and the pictures, I will have a roommate. Some schools have special dormitories only for foreign students, but KNU does not, or at least not for us. 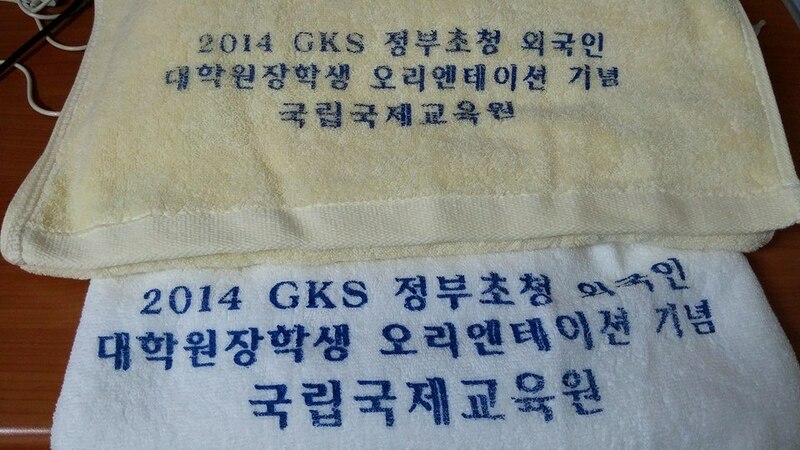 Some of us KGSP students are paired with other KGSP students, but my roommate will be Korean. There are advantages to both, I guess. The floor has a room with two showers, a bunch of sinks, and one washing machine, and a separate room with 4 or 5 toilet stalls and more sinks. So, yeah, communal facilities here. I think there are schools with en suite bathrooms, but ours is not one of them. When you become a grad student in your Master’s or Doctoral program you will probably get better choices for dormitories, along with the option of living off campus. Until then, you live with what you get. There seem to be other facilities (like computer rooms and common rooms) but I haven’t explored those yet. No co-ed visiting, or parietals as we called them in boarding school. No smoking in the dorm (I like that). My dormitory has a point system, with some violations resulting in an automatic ousting from the dormitory, and others giving between -1 and -5 points. The interesting thing is that you can also get points added (instead of subtracted) for reporting emergency situations, reporting other people’s violations, or participating in dormitory events (I haven’t been told what kind of events there are though… more on that later). If you get 8 minus points you are out of the dorm and banished for one year, so basically the rest of your language year. So that’s where I am so far. What is ESID? Some wonderful new scholarship? Some random government agency? ESID is (or was) the mantra of the JET Programme in Japan. It stands for “Every Situation is Different.” And I think it applies quite well to KGSP as well. It’s something everyone should keep in mind both when applying and when participating in KGSP. ESID basically means that you should not expect to have exactly the same experience as others, and what applies to some people doesn’t necessarily apply to you. It all starts when you apply. First, each country has that darned quota. Each country’s quota is different. Each embassy has a different process for choosing people. Each country will end up with a different standard of applicants. You may be a very strong candidate from a very competitive country and not get the scholarship, while others you think are weaker do get it. Your country’s embassy may only accept people who have studied Korean, while other countries accept even people who haven’t studied Korean. Unfortunately, that’s just the way the scholarship works. Every situation is different. Then you are accepted. You have to spend a lot of money to get a medical exam, while people in other countries can do it very simply. You have turn in extra forms for your visa that people in other countries don’t need. Every situation is different. Then you arrive in Korea. 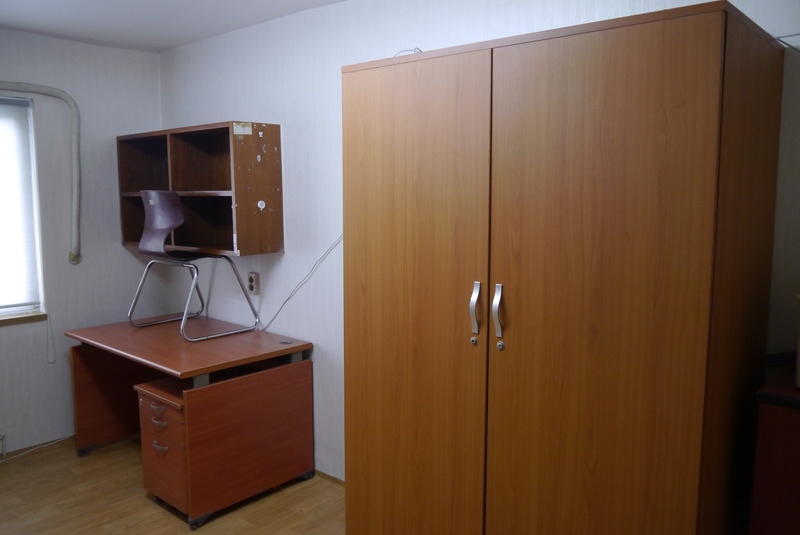 Your dormitory fee is very expensive, while a different university has cheaper dorms. Your dorm doesn’t have kitchen facilities, but your friend’s dorm does. Your curfew is very early, while another university doesn’t have a curfew. Your language course spends a week learning hangeul, while another just spends two days. If you look for them, you will be able to find any number of things that seem unfair to complain about. But with 800+ participants from all over the world, it is impossible to provide every single person with exactly the same experience. Even if you could, they would come with such different expectations that some people would be satisfied, and some people would not. I’m not necessarily saying that there will never be a legitimate reason to complain, or that you will never encounter something that is unnecessarily unfair. I’m just saying that the less you try to compare your situation to other people’s, the happier you’ll be in the long run. Try to make the best of the situation you have been given. In the end, if you have gotten the scholarship, you already have a big advantage over people who are not selected, so try not to worry about the differences between you and other scholarship grantees. I will warn you now. When you apply, you will spend the majority of the time from February to September waiting. Waiting for your recommendation to be written. Waiting for someone to confirm they received your application. Waiting for information about an interview. Waiting for the first selection result. Waiting for the second selection result. Waiting for the third selection. Waiting for contact from your language institute (or uni if you get to skip the language)… and… well, you get the point. I HATE waiting. That’s probably why I am spending my time talking about the program – it helps me to forget I’m waiting. Now a lot of this waiting has a deadline. There are certain dates when certain things are announced. It really can’t be helped. But then there is the other waiting. When you’ve sent an email to someone and they don’t reply right away. Or you’re waiting for your uni to send you info about something. My advice to you is to count to 10, take a deep breath, and sleep on it. First, make sure you keep track of the time difference between you and Korea. Display Korean time on your smart phone, set another watch to Korean time, or just memorize the time difference. Whatever it takes, remember that while you might be panicking, Korea might be sleeping. Give them time to get into work in the morning, have their coffee and look at their email. They’ll get back to you. Next, look up the national holidays in Korea. Time differences are obvious, but a lot of people overlook holidays. Sometimes if they are really swamped they may come in on weekends or holidays, but you should consider yourself lucky if it happens, and not expect it. An additional catch is that Embassies are often closed both for holidays of the country they are in, and their own national holidays. This year holidays were a big problem. There are several announcement dates that seem to fall on the same day every year. This year a lot of them seemed to fall right before a weekend or holiday. It was like a hit and run, send an email and disappear for a couple of days while people try to figure out what it means. This is annoying, but there is really nothing you can do about it, so keep track of holidays and find something to distract you until they can get back to you. Finally, stay calm and try not to send multiple frantic emails to whoever you need answers from. Take a minute to gather and organize your thoughts. Sit back and think about how urgent your question is. If you stay on top of things then most of your questions probably don’t need to be answered RIGHT NOW. Even if it seems like a really huge problem there probably is a solution and in most cases it doesn’t matter if it is solved today or tomorrow. Even if NIIED bought you a ticket from the wrong airport, if you aren’t leaving for another three weeks then there is still time to solve it. If you have carefully thought about it, and you really do need an answer NOW (like you are leaving in 3 days and your ticket is wrong) then it is probably better to call them. Just remember that there are relatively few staff members, and quite a lot of students who all have basically the same problems at exactly the same time… and most (staff and student) are communicating in a second language. Not to mention the fact that there are a lot of other things that the staff need to do aside from answering questions. Give them sometime, and if you still don’t hear back in one or two days, and it’s not a holiday or weekend, then you might want to contact them again because there might be some problem other than being busy. And sometimes you just have to resign yourself to the fact that they are never getting back to you. Try to keep contacting them, but also try to find other sources for information. And in the end, be glad for the opportunity to wait, and that your waiting will end with your arrival in Korea. This kind of waiting means that you have passed the current stage. There are many others who will end up waiting again for their next chance to apply.